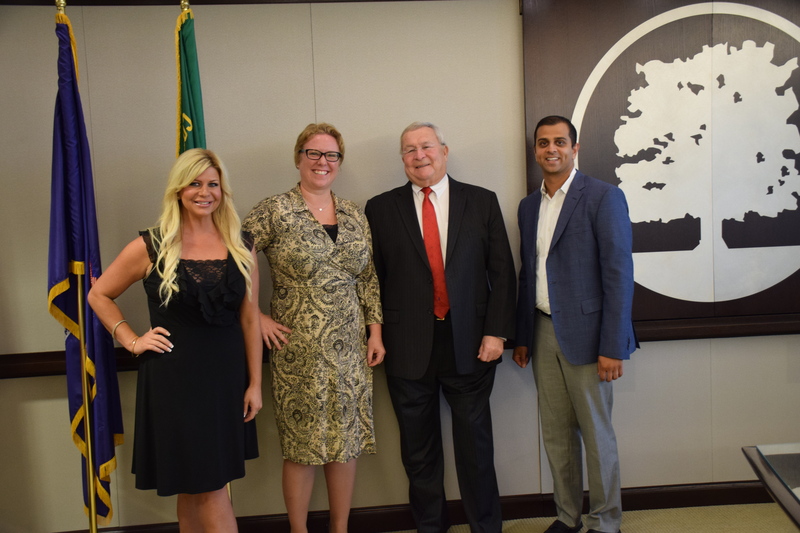 On Wednesday, September 16th, 2015, Oakland County Executive L. Brooks Patterson met with three members of the 2015 Elite 40 Under 40 class of 2015. The forum is designed to allow Elite 40 members a smaller, more intimate setting to connect with the County Executive and each other. The County Executive holds these forums in an effort to build friendships and connections among the Elite 40 and the county’s leadership. Attendees included Amanda Page of Page Law, Nirav Doshi, Managing Partner at Complete Data Products, and Shannon Lazovski of The Lazov Agency. Also in attendance was Irene Spanos, Director of Economic Development and Community Affairs; Kristie Zamora, Elite 40 Program Coordinator; and Bill Mullan, Media and Communications Officer. Once the members were seated and comfortable, the forum buzzed with energy as the candidates introduced themselves. Each member spoke of their personal dedication to their companies, philosophy and products. Patterson was very excited to hear the group all came from humble beginnings and paved their own way to success. Through blogging, family businesses and learning from mistakes, every member had an interesting story of success to tell. Irene Spanos was also able to engage with the group in making connections with other Elite 40 Under 40 members. Amanda Page is an Attorney and owner of Page Law in Royal Oak, Michigan. She learned from a young age that you should give back and does this through her mentoring in Detroit, and other local non-profits. Amanda is a celebrated member of the Oakland County Bar Association and loves helping her clients gain financial security and stability through holistic and personalized counseling. Nirav Doshie is Managing Partner at Complete Data Products in Troy, Michigan. He began working with his family in their Oakland County based businesses before branching out on his own. Through Complete Data Products, Nirav is able to help smaller financial institutions provide data solutions for their clients like larger competitors. Nirav enjoys the feeling of providing his clients with accessible products through his love of technology. He also loves the occasional shenanigans around the office. Shannon Lazovski is Chief Executive Officer at The Lazov Agency in Rochester, Michigan. She began her career as a blogger for Glamorous Moms helping mother’s regain their positive image. With her next business venture, The Lazov Agency helps small brands discover their ideal audience and leave a positive digital footprint. Shannon provides customers with a positive experience and a presence across the internet. Learn more about the Oakland County Executive’s Elite 40 Under 40 program at AdvantageOakland.com and view the entire class of 2015 HERE. Stay connected by following Advantage Oakland on Facebook & Twitter.